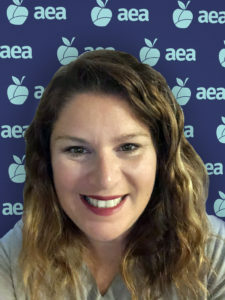 WASHINGTON, D.C. (July 19, 2018) – The NEA Foundation today announced that Jamie Stearns, an Eighth Grade Language Arts Educator at Benton Junior High School, is one of 46 public school educators who will receive the prestigious California Casualty Award for Teaching Excellence at the NEA Foundation’s Salute to Excellence in Education Gala next February in Washington, D.C.
Each year, the Salute to Excellence in Education Gala draws almost 1,000 supporters of public education, and thousands more online, to applaud these awardees. At the gala, the educators are truly the stars, celebrated throughout the night with music, performances, videos, and more. Of the 46 state awardees who were nominated by their National Education Association state affiliate, five finalists will be announced at the beginning of the school year and receive $10,000 at the gala. The nation’s top educator will be revealed at the gala on February 8, 2019 and receive an additional $25,000. The gala will be livestreamed at neafoundation.org. The NEA Foundation is a public charity founded by educators for educators to improve public education for all students. Since our beginning in 1969, the Foundation has served as a laboratory of learning, offering funding and other resources to public school educators, their schools, and districts to solve complex teaching and learning challenges. We elevate and share educator solutions to ensure greater reach and impact on student learning. We believe that when educators unleash their own power, ideas, and voices, communities, schools, and students all benefit. Visit neafoundation.org for more information. Find us on Facebook and Twitter, and subscribe to our blog.